Soma is an elegant, table-worthy glass carafe that contains an innovative filtration system made from biodegradable materials, including coconut shells and a plant-based casing. 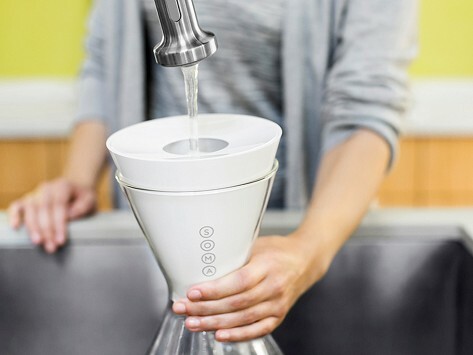 The Soma water filtration system includes a carafe and filter. But unlike plastic pitchers, the innovative Soma vessel is artfully designed with German engineered, shatter-resistant glass, and the filters are organic and compostable. It keeps water fresh and clear, with the added benefit of being elegant enough to serve at the dinner table. 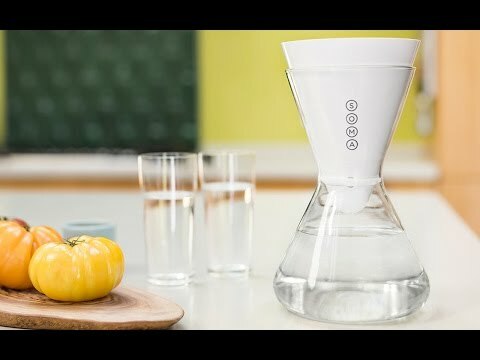 Soma founder Mike Del Ponte envisioned a water filter that was beautiful, easy to use and made of sustainable, plant based materials. He enlisted the help of water expert David Beeman, who designed filtration operations at Starbucks, Peets and Coffee Bean. Together they formulated the Soma filters with Malaysian coconut shells, an all natural solution that naturally screens chlorine and other harmful chemicals. The carafe has a minimalist hourglass shape, with no bulky handle. It’s sized to fit ergonomically in your hand and comfortably inside the refrigerator. This water pitcher is as crisp and clean looking as the water it pours.